UIC has limited parking available. There is street parking available in some areas. Be aware, many areas around 14th Place are marked Resident Parking, and is reserved for Residence Parking only. We recommend using Maxwell Street Parking Garage with access from Maxwell Street and Union Avenue. Visitors can park in the Maxwell Street Parking Structure: $2 for the first 2.5 hours, $5.75 for more than 2.5 hours after 3:00 p.m. Parking rates are subject to change by UIC at any time. From the South: Take Taylor Street/Roosevelt Road exit off of Interstate 90/94 (Dan Ryan Expressway) and turn left at first stoplight, which is Roosevelt Road. Cross over Interstate 90/94 (Dan Ryan Expressway) and make an immediate left onto S. Union Ave. The entrance to the Maxwell Street Parking Garage is just south of Maxwell St. on S. Union Ave.
From the North: Take Taylor Street/Roosevelt Road exit off of Interstate 90/94 (Kennedy Expressway). Continue on S. Union Ave. over Roosevelt Rd. The entrance to the Maxwell Street Parking Garage is just south of Maxwell St. on S. Union Ave.
From the West: Take Racine Avenue exit off of Interstate 290 (Eisenhower Expressway). Turn right at Racine and immediately make a left onto Harrison Street. Take Harrison Street to Halsted Street and turn right. Take Halsted Street about half a mile to Roosevelt Road. At Roosevelt Road turn left. Make an immediate right onto S. Union Ave. The entrance to the Maxwell Street Parking Garage is just south of Maxwell St. on S. Union Ave.
From the Downtown: Take the Ashland Avenue exit off of Interstate 290 (Eisenhower Expressway) and turn left onto Ashland. Take Ashland Avenue to Harrison Street and turn left. Take Harrison Street to Halsted Street and turn right. Take Halsted Street about half a mile to Roosevelt Road. At Roosevelt Road turn left. Make an immediate right onto S. Union Ave. The entrance to the Maxwell Street Parking Garage is just south of Maxwell St. on S. Union Ave. 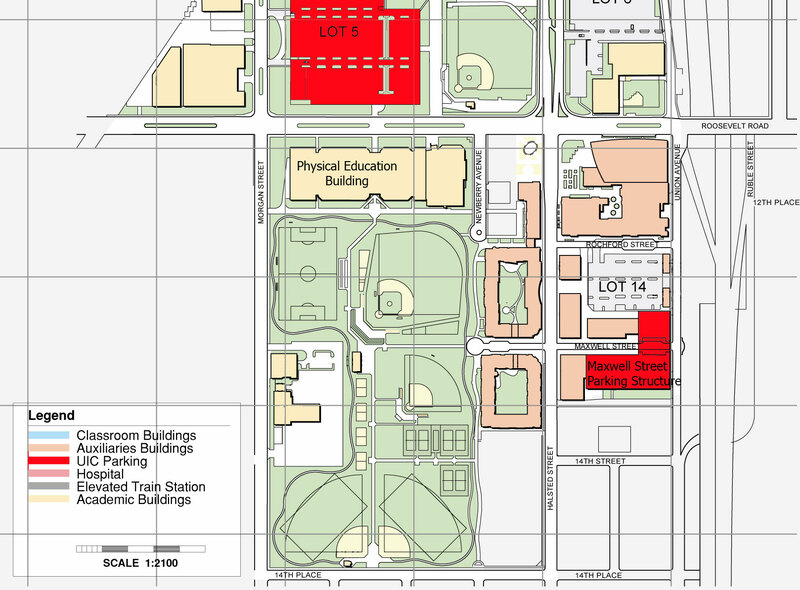 There is also parking available at UIC Lot 5 (1135 South Morgan Street), just north of Roosevelt Road accessable from Morgan Street. Visitors also can park in other UIC parking lots, rates vary: $3.50 - $9.00. Parking rates are subject to change by UIC at any time.